THE MAINE DEPARTMENT OF TRANSPORTATION WAS AWARDED $7.7 MILLION BY USDOT FOR INFRASTRUCTURE IMPROVEMENTS, EQUIPMENT, AND TECHNOLOGY INVESTMENTS FOR THE PORT OF PORTLAND: Improvements will include installing a new mobile harbor crane and other cargo handling equipment; constructing a highway and rail crossing upgrade; and building a terminal operations and maintenance center. California awarded $49 million by USDOT to construct final segment of freeway to the Otay Mesa East Port of Entry. Savannah awarded $44 million by USDOT to reconfigure the port’s on-dock intermodal container transfer facilities. PANYNJ awarded $10.7 million by USDOT to help optimize a railcar float system and reduce highway truck traffic. The United States Department of Transportation (USDOT) has reported to Congress the first list of grants it intends to award under the new Nationally Significant Freight and Highway Projects program. Referred to as FASTLANE, the program was created when the FAST Act was signed into law on December 4, 2015. Under that law, USDOT is required to notify the authorizing congressional committees of projects being awarded under the program. The list must remain with the committees for a 60-day review period before the agency can issue awards. USDOT notified the committees earlier this month of 18 projects selected to receive a total of $759 million in fiscal year 2016. FASTLANE has received 212 applications for projects totaling roughly $10 billion, more than 10 times the available amount. Congress authorized a total $800 million in funding for the FASTLANE program in the current fiscal year. Among the projects improved, the California Department of Transportation, in partnership with the San Diego Association of Governments, will be awarded $49,280,000 in funding to construct the final segment of a new freeway (California SR-11) to the future Otay Mesa East Port of Entry. International trade has grown by 115 percent since 2003 at the Otay Mesa Port of Entry, the second busiest commercial border crossing on the U.S.-Mexico border. The total project cost is $172,200,000. The Georgia Ports Authority will be awarded $44,000,000 of a $126,700,000 project to reconfigure the Port of Savannah’s on-dock intermodal container transfer facilities to bring rail switching activities inside the port. Current switching on existing rail infrastructure causes traffic backups on two state highways, and prevents all of the containers that are loaded onto railcars one day from leaving the Port that same day. The current inefficient yard arrangement is the port’s largest productivity chokepoint. The Massachusetts Port Authority will be awarded $42,000,000 of a $102,890,000 project to improve the facilities and structures of the Paul W. Conley Terminal in the Port of Boston. Elements of the project include deepening, strengthening and repairs to Berth 11; constructing Berth 12 fender improvements and backland pavement; implementing refrigerated container storage improvements; and building new gate facilities. The City of Seattle will be awarded $45,000,000 of a $140,000,000 project to grade separate South Lander Street over the north/south BNSF rail line. Located south of downtown Seattle, South Lander Street currently intersects with a major freight rail line, near the port, with more than 3,200 rail cars traversing the line per day. The project supports access between Port of Seattle terminals, intermodal facilities, and the state highway system. The Iowa Department of Transportation (I-DOT) will be awarded $25,650,000 of a $46,500,000 project to build a full service intermodal facility in Cedar Rapids. Cedar Rapids is located between Chicago, Kansas City, and Minneapolis, yet lacks the intermodal capabilities of many other cities of similar size. The project will construct integrated facilities for a container intermodal terminal; a rail-to-truck transload facility for bulk commodities; and a cross-dock facility for consolidating and redistributing truck loads, as well as loading and unloading containers. 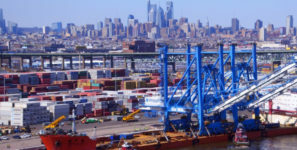 The Port Authority of New York and New Jersey will be awarded $10,672,590 of a $17,787,650 project for intermodal rail improvements to help optimize the Port Authority’s railcar float system and reduce existing highway truck traffic in the area. The project will make improvements to the 65th Street Yard by increasing its capacity of the existing transloading dock and installing a truck weigh station, among other improvements. The project will double-track a portion of the Port Jersey Division of New York New Jersey Rail, currently a single-track freight line serving a series of local warehouses and distribution centers adjacent to Greenville Yard. The Oregon International Port of Coos Bay will be awarded $11,000,000 of a $19,555,000 project to rehabilitate tunnel infrastructure on the Coos Bay Rail Line (CBRL), as current structural, track, and drainage conditions could pose risks to continued operations on the line. The project will improve nine tunnels between a connection with the Union Pacific Railroad near Eugene, Oregon, and rail shippers in the western Lane, Douglas and Coos Counties region of southwest Oregon. The project will help the port maintain long-term, low-cost rail transportation service.